Years ago I went through a period of wearing contacts instead of glasses. Putting them in every morning really woke me up. A little jolt from the fight or flight response as I had to overcome my natural instinct of not poking myself in the eye. Also, you can now purchase and download Biff and Maximumble ebooks directly from my store! It’s the future! I’m unsure what relevancy contacts have to this, but that was an interesting story. I used to be terrified of poking myself in the eye, but then my kindergarten teacher challenged me to do it. Not that hard. Waffles! How fitting, because last Sunday it was “Waffle day” here in Sweden! …But I didn’t realize that until today… I used to like waffles when I was a kid, but I’m not such a big fan of them anymore for some reason (and no, it’s not that I ate too much waffles at some point). 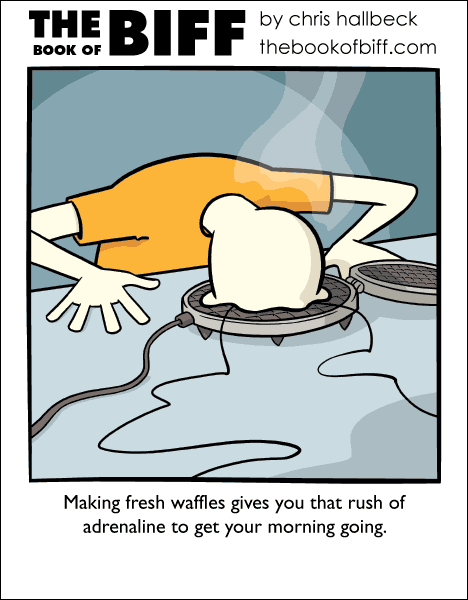 you should try waffles. they are different enough from pancakes to be their own food. but be sure to try a good one (NOT eggos or similar). I liked how cool the contacts were when I’d first put them in. kind of like a splash of cool water on my face to wake me up. I have enough adventure keeping track of my specs, without having to discover some undocumented manner of losing contact lenses. My brother has me beat on reasons to get new glasses. Once, the school bus ran his over.